Get a drink & a snack & get comfy, because this is going to be a long post! 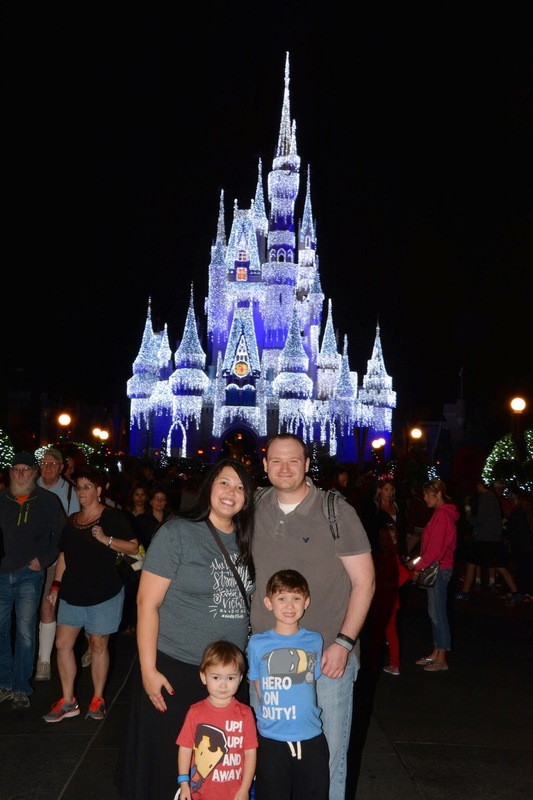 We had such a magical time at Disney World, I want every moment captured in our blog so that we can go back & reminisce. 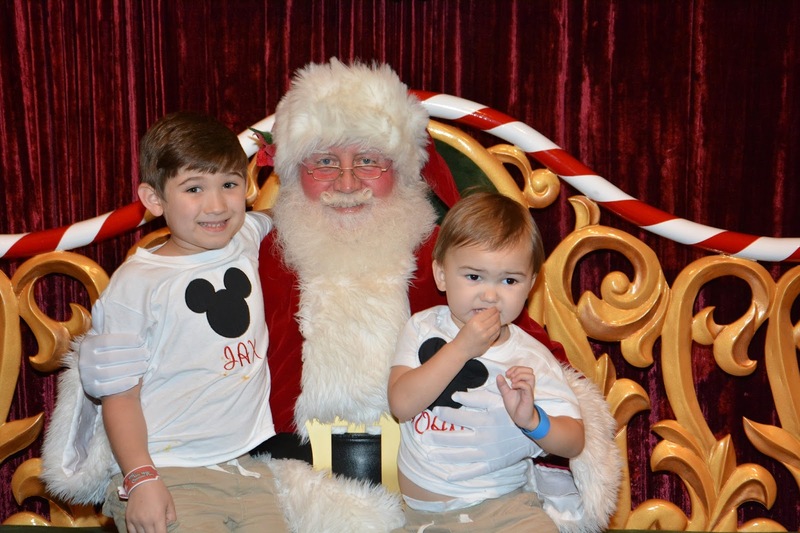 These boys are excited for Disney! We checked into our hotel & everything was decorated so pretty for Christmas! The boys got Mickey Mail when we got to our room! Even the smallest details were magical! Mickey towels, shampoos with Mickey hats on them, etc. We jumped on the shuttle to go play at Magic Kingdom right away! Excited!! We got to ride a few fun rides. Here's a pic of me & John on Dumbo the Flying Elephant. Mom & Dad riding Dumbo. Jax & Daddy. They liked to go as high as they could!! Waiting to watch Mickey's Philharmagic show. It was 3D & so great. John was trying to catch the things that seemed to be flying out at him. We had dinner at 1900 Park Fare in the Grand Floridian. There were lots of great shops & a life-size gingerbread house in the hotel. I could have stayed in there a long time! Obligatory photo in front of the tree. This is where I had to tell the boys that they better get used to their photo being taken all day everyday! Some characters stopped by for a visit during dinner! Everything's magical at Disney. Even dessert! Our first Mickey moment MADE the trip for me. It's my most favorite memory from the trip. After dinner, we went back to Magic Kingdom to meet Mickey at Town Square Theater. After meeting Mickey, the park was emptying out. 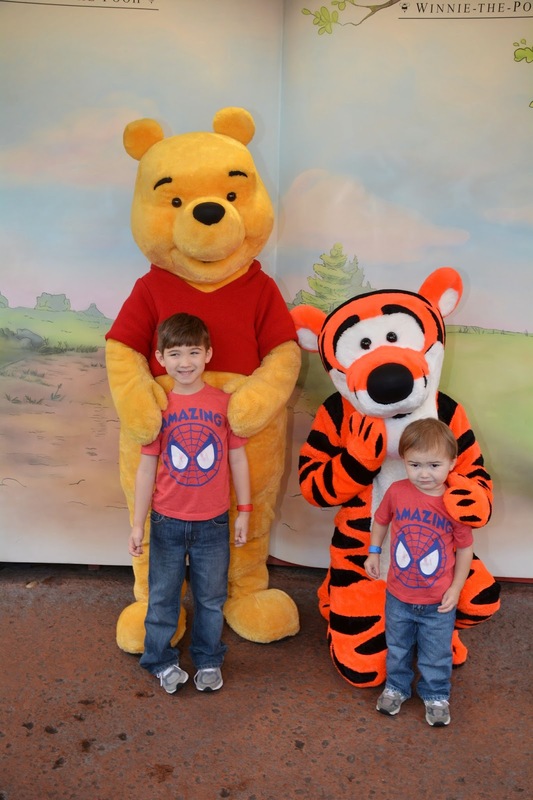 We decided to go check out Adventureland b/c Jax had big plans to find a new sword at Disney. We walked by the Pirates of the Caribbean ride & it had no wait! We jumped on & rode that. Of course, it let out into a gift shop where they just happened to be selling swords & all kinds of pirate fun. After that, we passed by Aladdin's Magic Carpet ride, so we rode it too! Day 1 couldn't have been better!! On Day 2 we spent most of the day at Animal Kingdom. They had a HUGE Christmas tree right when you enter the park. It was beautifully decorated with animals & fun things that went along with the animal theme. We enjoyed brunch at the Tusker House in Africa. It was very good. 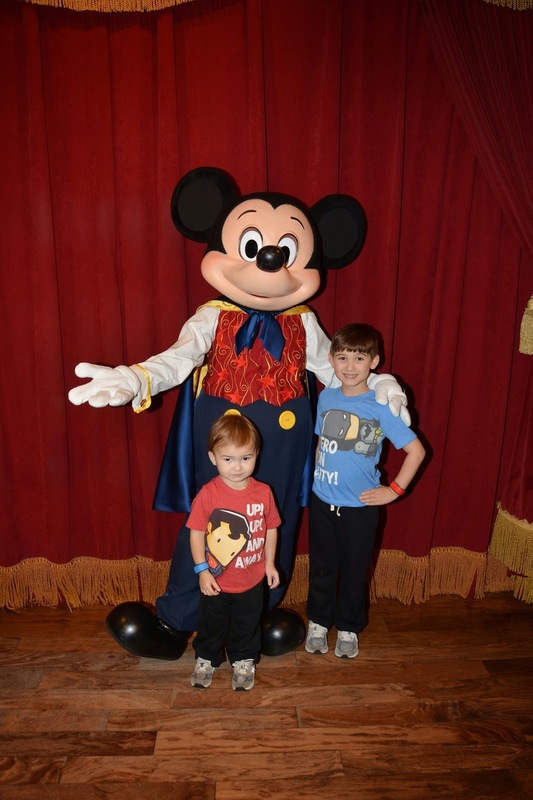 We got to see Mickey again-this time in his safari attire! You can't get cuter than a Mickey-Head shaped waffle! Mickey came to our table twice during this brunch. I'm sure it's b/c Jax & John are his favorites! Next, we went on the Kilimanjaro Safari ride. It was really great. This was mine & D's favorite part of Animal Kingdom. We saw soooo many animals. I didn't get a picture of them all. Here's one of many giraffes. We saw so much more. It was about a 20 minute ride. I could've gone at least an hour. We asked Jax what his favorite part of the safari was- he said it was seeing the termite mounds. After our safari, we took a train ride to go see Chip & Dale! We went to the 3D viewing of "It's Tough to be a Bug"
It was a wild 3D show! We got squirted, sprayed by a stink bug, & all kinds of other crazy things that boys love. After that we shopped around Animal Kingdom a little. John bought a stuffed Safari Pluto & Jax bought a stuffed rhinoceros. 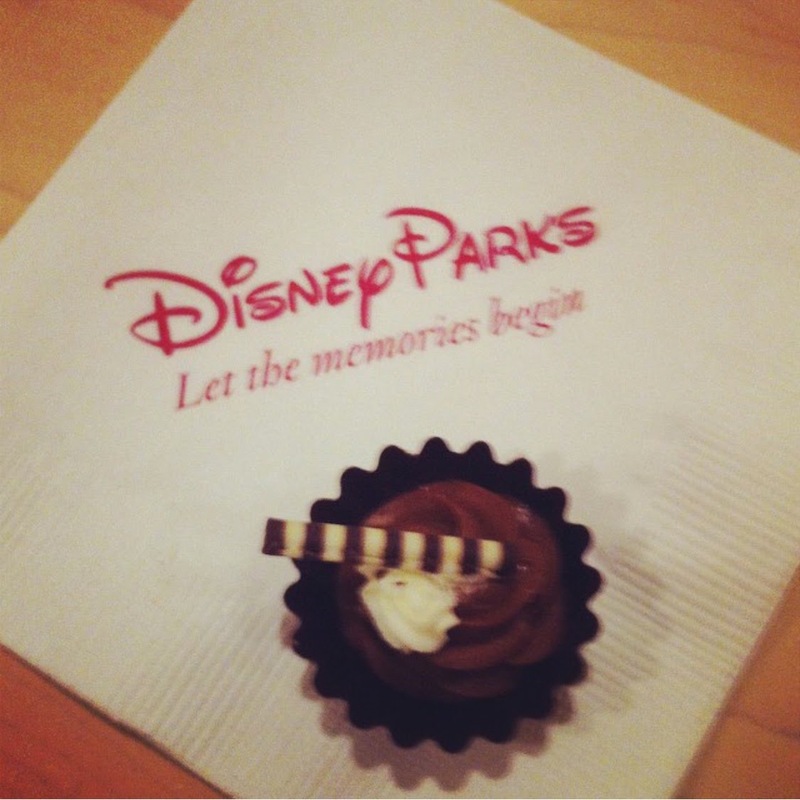 Then they enjoyed a Disney must-have treat! After Animal Kingdom, we headed to Magic Kingdom. 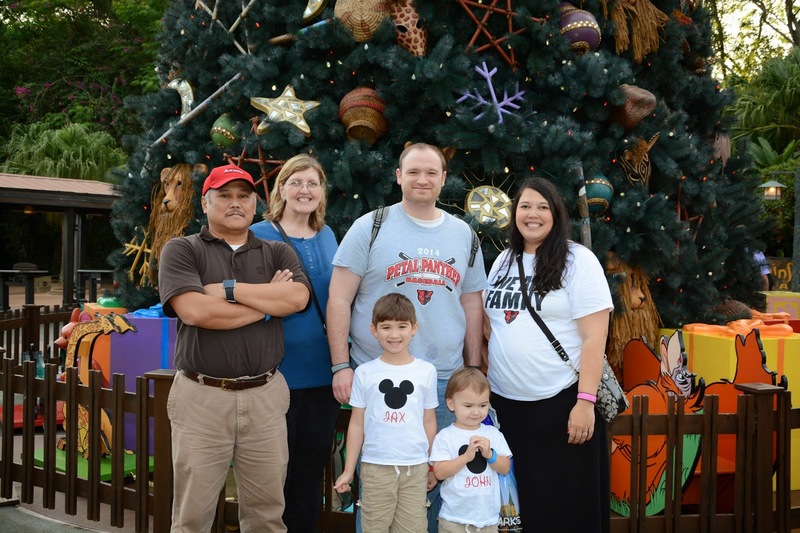 We had dinner at Magic Kingdom & waited for Mickey's Very Merry Christmas Party to start! We waited to see Santa. He was a jolly friendly fella. Jax requested a picture with the toy soldier. 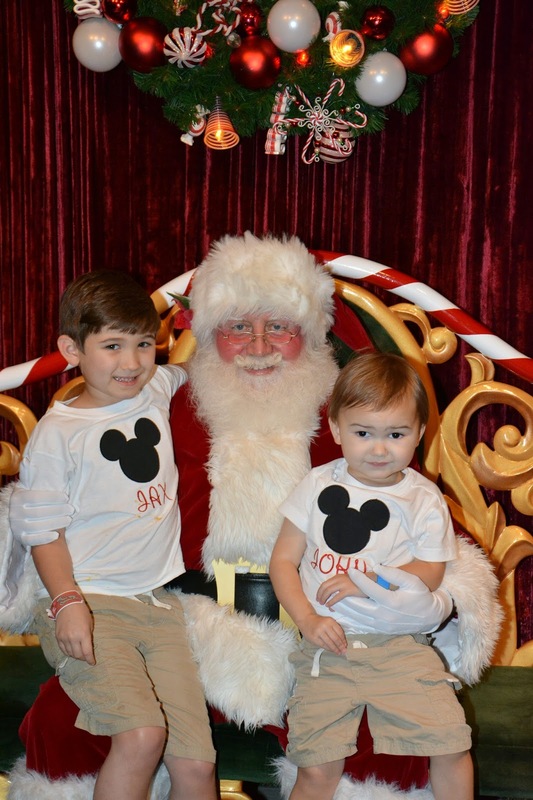 We shopped for a little, then headed to the castle to see Mickey give Minnie her Christmas present. After that, we watched most of a Christmas parade, but then left a little early to jump on some rides with no wait! Here we are on "It's a Small World." & of course the Tea Cups! This is Jax riding with Mimi & Mitz. We started out Day 3 in Magic Kingdom again. 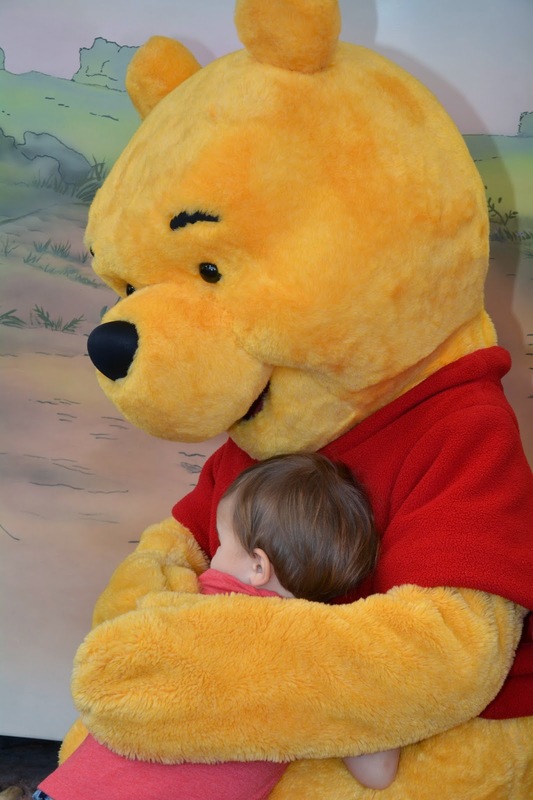 We rode The Many Adventures of Winnie the Pooh. We rode in a great big honey pot. Too cute. 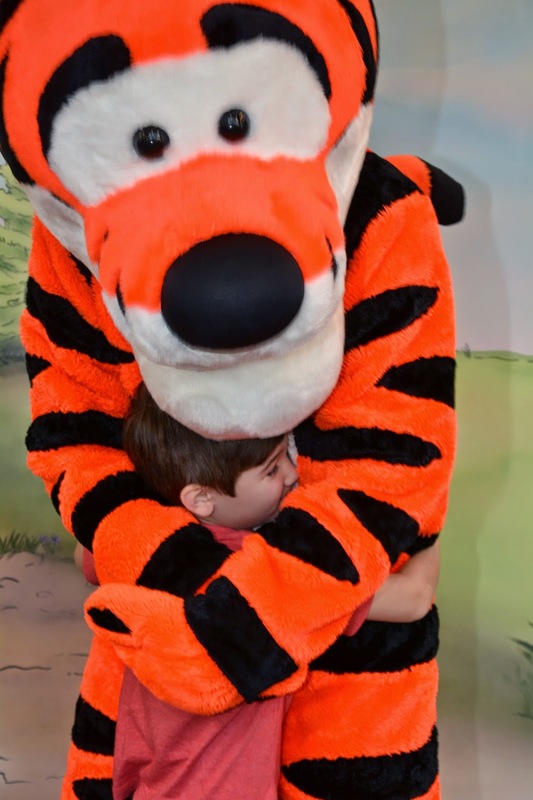 It was cute (especially for John) but he was eagerly anticipating getting to meet Pooh & Tigger. I love how attentive the characters were with the boys. It was so fun just to get to watch them meet their faves. 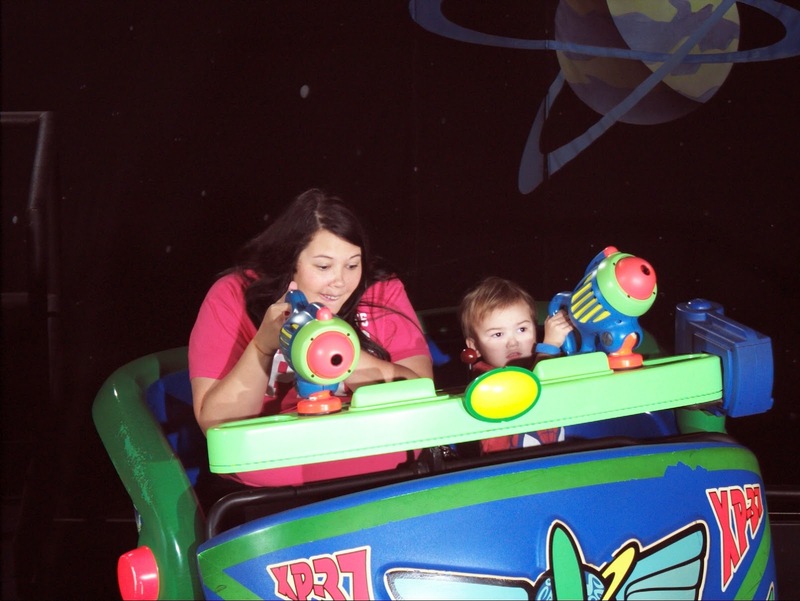 Next we rode on the Buzz Lightyear Space Ranger Spin ride. 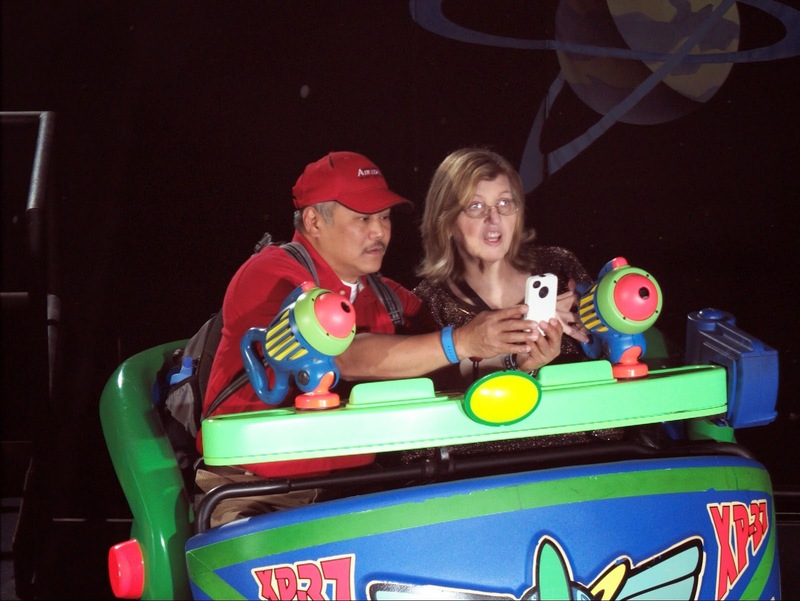 My silly parentals taking pics/selfies on the ride. Meanwhile, the competitive Dunns were trying to rack up the points! Daddy wasn't gonna let anybody beat him! We cracked up so hard at this pic. Like all Disney rides, this one let out into a gift shop. The boys both saw guns they wanted, so Mitz got them. We hung out in Tomorrowland & the guys raced go-carts on the Speedway. At first, I didn't realize that the cars were on a track, so I had a small heart-attack when I see my 2 year-old come out IN THE DRIVER'S SEAT! haha. Mitz rode along to help. Jax drove him & Daddy. We shopped around Tomorrowland a little more & had lunch there. 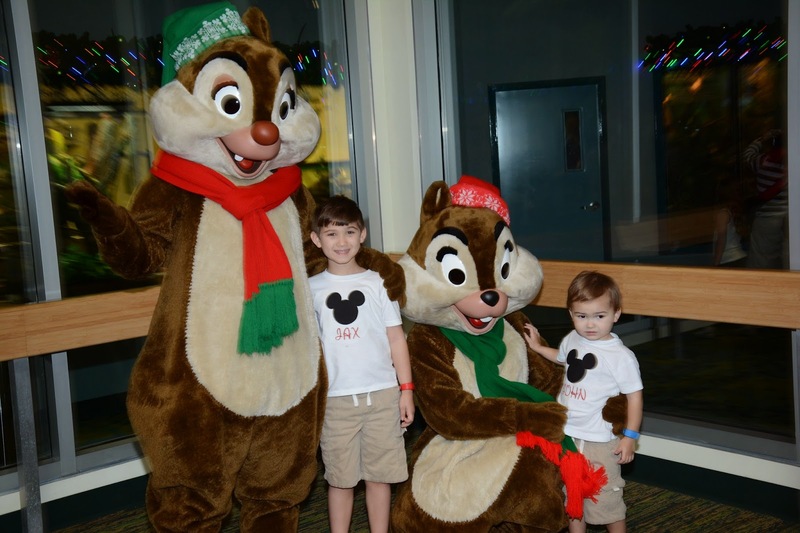 Then, Mom & Dad took the boys back to the room to rest & nap, while D & I went to check out Downtown Disney. After resting a bit, we went to Epcot for dinner & fireworks. Jax didn't nap in the room, so of course he fell asleep on the shuttle to Epcot. We had dinner reservations at Akershus Royal Banquet Hall in Norway in Epcot. We got to meet a lot of the princesses during dinner. haha-John's face cracks me up. He wasn't too interested in the princesses. The food was really good here. It was Norwegian. D had venison stew & I had butternut squash ravioli. The parentals had pork chops & steak. Jax followed in our adventurous footsteps & had salmon & broccoli! 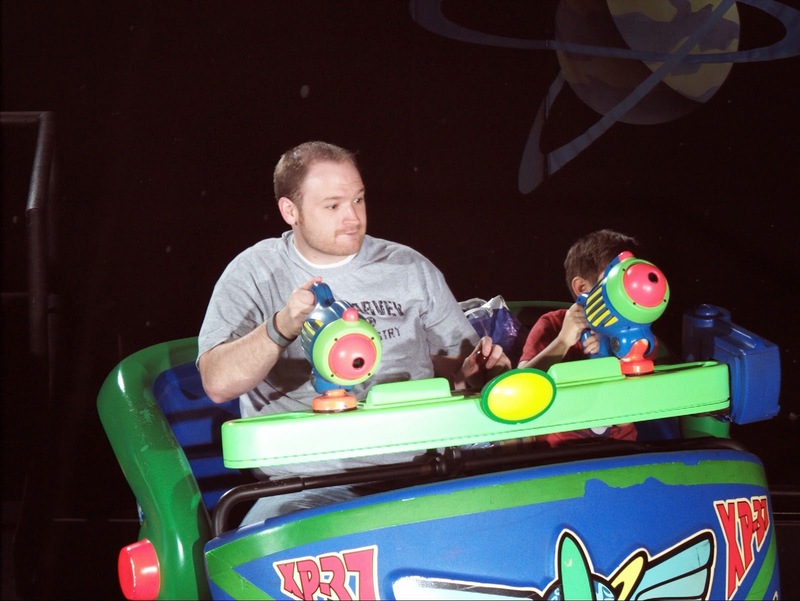 Here's a pic of silly John, I mean, Buzz Lightyear with his new (nerf) laser gun. The rest of the week to come soon!